Well, this is the first time I’ve been able to say this… but every last bit of the organising, from the location and accommodation to the flights – was done by someone else. Consider that a completely unnecessary disclaimer, because it worked out to be a fantastic week away. Every year, a group of our friends go skiing. Emma (my wife) has been twice before (a long time ago) and this time we both went along. This year they were going to St. Anton in the Arlberg region of Austria. There were 12 of us in total, and we would be staying in a 5* chalet, organised through Crystal Ski Holidays. We would fly to Innsbruck, and then take a coach to the chalet where we would be staying for 7 nights, getting in 6 full days of Skiing. As you may have noticed from my flight log, this is the first flight on a charter airline for a long time, and the first time in economy for quite some time too. But with my iPod and a fist full of shiny status cards, I was ready for the fight! At 05:20 our taxi arrived to take us to Gatwick North Terminal. We stumbled out of the front door with our bags, and made it to the terminal to meet the rest of the group for when the flight opened for check in at 05:45. For the last few years, airports have been part and parcel of my every day life. For 99% of my flights, I will have already checked in online before even thinking to book my taxi. I’ll wander up to the First Class check in desk (or the self-service kiosk if there’s a queue) and 5 minutes later I’ll be looking for the fast track security queue through to departures. As I do all this, I sometimes even notice the queue that snakes its way around the airport to the charter check in desks. This time, I couldn’t help but notice the queue. I formed part of its many many links. But then, the strangest thing happened. We started moving… the line that I thought never moved did actually make its way towards the checkin desks. In fact, it only took about 20 minutes – significantly less time than I’d first thought. For the 12 of us, each with bags, 11 pairs of boots and 3 sets of skis, the check in was painless, and unlike a few companies there was no charge for the skis. I was to sit in 34A (yes – it does go that far back) and we were all sitting together for the short 90 minute flight. We wandered round to the security queues which would take us through to the departures area. 20 minutes later we were through to the departures lounge, with a little over an hour to while away before the flight. I thought I’d pop into the BA Terraces (Business Class) lounge to grab a spot of breakie and an orange juice. I wandered up to the lounge dragons that guarded the sacred gates and proudly placed my First Choice Economy boarding pass on the desk in front of me. The lounge dragon started to explain that this was the British Airways Lounge for British Airways passengers. As she did this, I fished around in my wallet for my BA Gold Card, and placed it on top of my boarding card. The lecture ceased as she saw the card, then looked up at me, and then said “I’m very sorry sir, please go right ahead”. I smiled my cheeky smile, and in I went. I grabbed a pain-au-chocolat, an orange juice, and a copy of Business Traveller, and headed back out. I went off to find the rest of our group, some of which had settled down in one of the bars. I passed on my order for a pint of Guinness (well, it was nearly 7am!) and settled down in time to hear a tannoy announcement for one of the people in our group to return to security. It reminded me of the “lost child” announcements we used to put out in supermarkets for friends while at university. Today though it was a case of a bag that had been left on the x-ray machines, probably minutes from witnessing a controlled explosion first hand. Kids eh? I was half way through my pint when a call from another member in the group told us we were boarding. 10 seconds later, our glasses were empty and we made our way to gate 45 where we took a coach to the waiting Boeing 757. As we boarded the aeroplane, I glanced left and noticed that the flight was economy-only – there were no upgraded seats available. We made our way to the rear cabin, and took our seats. I’m not the tallest person in the world, but I do have fairly long legs. I was a little uncomfortable in my seat, but since this was only a 90 minute flight, it wasn’t the end of the world. My knees did press against the seat in front of me, and you could tell that the seat pitch was slightly shorter than those of non-charter airlines. (Charter airlines often put the seat rows slightly closer together so they can fit in an extra row of seats.) We watched the video safety briefing, and 10 minutes later we were airborne. As the crew came round, I was impressed to see they were serving a hot breakfast, much like the one offered on British Airways domestic flights. It wasn’t long before one of our group bought a bottle of champagne, and I was even more impressed that First Choice offered a decent bottle too – Nicolas Feuillatte. Throughout the flight, videos advertising First Choice products were played on the TV screens (which hung in the aisles at 10 seat intervals). If you weren’t interested, it was quite intrusive, so I just popped on my noise cancelling headphones (without plugging them in) and read my book. Overall, it was a good flight – much better than I’d been expecting from a charter company (especially after hearing friends’ horror stories!) The crew made a number of announcements hoping that we were enjoying the “Star Class” service. It wasn’t until I looking on the internet that I realised that Star Class is just another name for “economy”. When we landed, we were bussed to the main terminal where our bags were already making their way around the conveyor belts. We regrouped and went outside to board the Crystal provided coach to our accommodation in St. Anton. We were soon on our way to St. Anton. Our Crystal rep introduced himself, and gave us each welcome packs containing details about St. Anton (a piste map and information about the town itself), as well as some snacks. The rep came round to arrange boot and ski hire for those that needed it, as well as ski-school lessons. He also handed out our ski passes. Both Emma and I had skied a number of times before, but not for a good few years, so we decided to sign up for 3 days of group ski-school lessons. The traffic was quite heavy, with the journey lasting about 90 minutes. We couldn’t go all the way to our chalets by coach, so once we’d arrived at St. Anton, Taxis arranged by Crystal took us to the chalet front door. We arrived at Tirolerhaus about 30 minutes before we could check into our rooms, so we decided to go to the local InterSport to collect our skis and boots. There are 4 InterSport shops in St. Anton, and fortunately there was one just a couple of minutes walk from the chalet. We’d been given a voucher by our rep on the bus, and handed this to one of the guys in the shop. Once we’d entered our height, weight, age etc. into a computer, it printed off all of the details the shop needed to allocate and configure our skis. The whole process took no more than 10 minutes from entering to leaving the shop, and we then headed back to Tirolerhaus and placed our skis and boots in a room under the chalet. When it came to choosing our rooms, fortune favoured the quick. There were only a couple of rooms with baths, some rooms had balconies, some had joined twins beds, and some had separate twins. They were allocated on a first come first served basis, and we got a twin room with a bath, but no balcony. We were happy with this, as after a hard day’s skiing, a bath is welcome sight. We then headed out to find the nearest bar, which was fortunately no more than 10 paces away. Given the fact I hadn’t really eaten too much during the day, this probably wasn’t the best move! Many beers later, we went back to find a spot of food. Every evening the chalet provided champagne and canapes, followed by a 3 course meal. The canapes and champagne were a nice touch, but the dinners were fairly average. This was probably due to one chef trying to cater for 28 people at the same time from a small kitchen, but the meats were generally overcooked, and the veggies were pot luck! They also provided tea/coffee brought to your rooms in the morning, and in the dining room they offered eggs for breakfast (always done nicely) with a selection of breads, toast, jams, juices etc. When you return from skiing in the afternoon, there are tea and cakes waiting for you in the dining room. 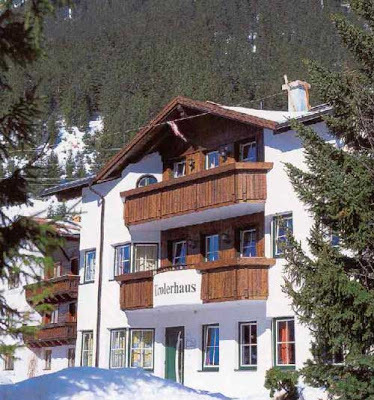 The location of the chalet was excellent – it was 2 minutes walk from the ski lifts and the InterSport shops (for hiring & buying equipment), and 10 minutes walk from the centre of town for shopping and Apres-Ski. There are two main reasons you go on a skiing holiday – 1) the Ski, and 2) the Apres-Ski! St. Anton is not for the beginner. There are lots of Blue slopes, but 90% of these are Red by most other resorts’ standards. The problem is, if they were graded as they really are, nobody would come. On the other hand, Reds were in many cases easier than the Blues. I would say that this was largely because a lot of people would start off on the Blues, realise they were quite hard, and so keep off the Reds. As a result, the Reds took less of a pounding. The best time to ski was by far the mornings. The lifts opened at around 8am, although in fairness I never arrived at the slopes before 9am. After lunch, the slopes have seen many many skiers and boarders. By the early afternoon, the beautiful flat pistes at the lower altitudes had turned into mogul runs. The further down you went, the slushier it got. As a result, the best advice I can give is to stay at 2000m or above. By the afternoon, the best place to be was generally the Red slopes, due to the moguling of the Blues. The Blacks were better still – they were often in excellent condition, far less congested, and great fun. 2 – A fantastic run. From the lifts it looks steeper than it feels when you’re on it. We did this in zero visibility and found ourselves on a purpose built mogul course that runs on the right (as you ski down) just off the piste. 10 – A very short black run. If you’re confident on Reds and haven’t tried a Black, I’d recommend this to get a feel. 35 – This is a good alternative to 36 from the top of the mountain, and can be a fun challenge. It runs to the bottom of the button lifts at Gampen, so you can easily break off here and get the cable-car down at the end of the day. 6 – This is effectively the start of 2 (Black), but you can break off before you hit the steep part of 2 (Black), and take a T-bar lift back up to Glazig. I took this lift during a white-out – I couldn’t even see the person in front of me… I managed to get off before the end as it crosses over 9 (Blue) because I had no idea if that was the end or not. Ooops! 7 – A nice Red. I would recommend using this as a way of getting to 2 (Black), rather than getting the T-bar back up. Although it’s not obvious from the map, it pretty much follows straight on to 2. 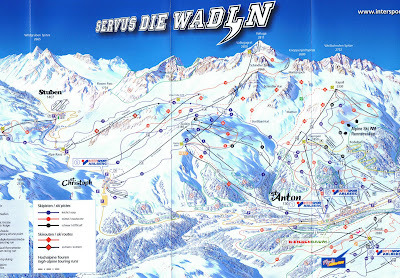 14 – This is a great Ski down on your way to Stuben. It follows on to 12 (Blue), and shortly after this there’s a restaurant with particularly grumpy staff! 24a – If you’re on 24 (Blue) on your way back down to Nasserein, this Red is a much nicer alternative – get on it as soon as you can. 37 – This is a great Red run. You can either ski down and take a T-bar back up to the top (Kapall), or use it as a much nicer alternative to 36 (Blue). 37 isn’t very busy, and well worth a few runs. 4 – A fantastic run in the right conditions – usually it’s great, but on one occasion it was very moguly. It’s called Happy Valley because a some of it’s straight and steep with a long run off at the end. Good fun if you fancy a bit of “skis together and off you go”. 5 – A great slope for practicing your technique. Not too steep, nice and wide, and not too busy. This is usually in a great condition throughout the day as it’s nice and high. 8 – Follows on from 5, and takes you down to St. Christophe. One of the easier blues, but the restaurants at the bottom can be pricey if you’re stopping for lunch. 11 – Shorter than it appears on the map, and not advised if you don’t like narrower runs. It takes you down to a lift which you can use to zig-zag over to Stuben. Personally though I much preferred just going to Schindler Kar and taking 14 (Red) and 12/17 (Blue) down. 12 – The “shoosher”. Once you’ve gone around the bend, you really do have to shoosh the rest of the way, because there’s an uphill at the end. 17 – A motorway. Straight most of the way, takes you all the way to Stuben, and has a few dips, but very nice. 20 – An easy blue that takes you to various lifts. 24 – Don’t bother. I did this as the final run on the first couple of days to go back to St. Anton, and to be honest, it’s more trouble than it’s worth. It gets slushy, moguly, and it’s not particularly fun. Take the cable-car and enjoy the view. S1 – The “S” standing for Stuben, this run takes you from the end of 17 into Stuben. It was a little icy as some parts were in the shade, but it was otherwise OK. The one thing to watch though is that it’s a 2 man chair lift to go back up, and since it’s the only way back up, it can be quite a wait (a good 20 mins queuing when we did it). S1 also takes you back from the top of the lift to the bottom of 17 where you can get a 4-man chair lift back to the top. The second part of S1 was quite good fun – one of our group took some video, which I’ll post here when I get it. Having not skied for 6 or so years, Emma and I decided to do group ski school lessons on the first 3 days. Unfortunately you can only do full day lessons – previously we had been used to having lessons in the morning, and having the afternoon on our own to practice. The cost for 3 days was about 180 Euros each (from memory). They watched us ski down the nursery slope, and put us into either the Beginner or Intermediate group. I was put into the Intermediate group, which had 12 people in total. We did about 3 goes on the nursery slope perfecting our turns, and then went up the cable car and did 20, 1, and 36 (all blues). By the end of the first day it was clear that a few of the group members were struggling, and should probably have been in the beginners’ class. This meant that we were often waiting 10 or so minutes for people to catch up. In addition, our Instructor didn’t have a great English vocabulary. In fact, his two expressions were “Traversing” and “Shoulders to the valley”. The lesson ended at the bottom of 36, and most people got the cable car back down to Nasserein. 3 of us were considered to be stronger skiers, and the instructor took us down 24. Although 24 was a pretty crappy slope (lots of moguls and quite slushy) it was great to be able to go at a fast pace – there was no hanging around waiting for people to catch up. We were a bit put off by day 1, but we decided to give day 2 a go. This time we did 5, 8, 9 and 4 (all blues). With a similar group and the same instructor, we had the same issues. On the morning of day 3, we went to the ski school office to see if we could convert our last day to private tuition. We were able to do this, and for an extra 93 Euros, we had a 2 hour lesson for the 2 of us in the afternoon. This was worlds apart. A fantastic instructor (called Morten) took us over to 5 (blue) where the conditions were perfect to practice our techniques. We spend most of the time there, after which Emma took the cable car down to the bottom to get started on the Apres-ski. Morten then took me on 10 (black) and 9 and 4 (blues), which were great fun. I then took 1 (blue) on my own down to meet Emma at the bottom. 1 was pretty crappy by this time in the afternoon, but do-able. We both felt the lesson was so good, we decided to book another 2 hour lesson. For the first hour we practiced on 20 and 1 (blues), which were good runs for the morning. After the first hour, Emma felt the bar looked more inviting than another slope, so Morten and I skiied on 37 (red) a few times, and then 35 (black). This was brilliant, and also a real confidence booster. Morten also said he really enjoyed it, as there aren’t many lessons he gets to bomb down black runs! Having done 35, I was happy doing every other slope at the resort. I spent the afternoon skiing with a couple of friends that Emma and I had come on holiday with – they were very experienced skiiers, and it was great fun – even if the visability was almost zero for most of it! Ah yes. The drinking starts the moment your boots leave the bindings and our first port of call was often Bar Cuba. Scotties is also nearby. I only went here once, and when I did it was rammed, but I’m told it’s generally pretty good. Kan-da-har’s is a nice venue – you go downstairs to get to the bar, which serves food for most of the evening too. For more info on some of the good spots, have a gander here. When you’re staying at a Chalet, you generally have all your meals provided for you. All but one. The Staff in every chalet in St. Anton have Thursday off, which means you need to get booking your evening meal out asap (because everyone else will be too). We thought we’d have a bit of a posh one, so we booked a table in the restaurant of the Schwarzer Adler hotel, right next to Bar Cuba. This was a very old style restaurant, with fabulous food and excellent service. We liked this place a lot, and I would definitely recommend it to anyone who fancies some posh nosh. For reference, 2 of us had champagne, wine and 2 courses, and it came to just over 100 Euros. Unfortunately, it wasn’t long before we were on our way back to the airport. On the last day, we checked out at 8am (not as early as the trip out, thank God!). Taxis took us to the waiting coach on the other side of St. Anton. On the way back, the traffic was much better, and the coach journey only took us 45 minutes. …or at least we tried to enter the terminal. The queues for check in were right the way back to the entrance doors. Oh for Online Checkin!!! While we queued, those with skis went to check them in to out-sized luggage. Initially there was 1 desk open for our flight, but after 15 minutes a further 2 opened up. It took us about 30 minutes to get to the front. First Choice offer seats with additional legroom for an extra 15 Euros, so I asked if there were 2 available – unfortunately there was only 1, so we just went with our allocations and sat with the group. This time I was in 40A!! I honestly (honestly) had no idea you could get 40 rows on the 757s! That was impressive, if not a little scarey. We’d been advised by our rep that there’s just one duty-free shop once you’ve gone through security, so it’s worth waiting land-side as long as you can as there is much more on offer. We went to a restaurant to grab a few beers and an early lunch. I wasn’t going to chance the offering on the plane, and new it would be nearly 3 before we got home. About 45 minutes before the flight, we made our way through security, which was pretty painless compared to Gatwick. On the other side, we were pleased to see that the duty free offering was pitiful, and we were glad we’d held out in the restaurant. We made our way to gate 9 where our flight was boarding, and we again had a bus to take us to the plane. As we made our way back to our seats, I was pleased to see that we were the very last row in the cabin – pleased because if they tried to cram any more rows in, there’d be no chance of taking off! Fortunately, we did manage to take off, and the flight was much the same as the way out… there was the constant playing of First Choice adverts (with sound broadcast to the whole cabin). I again put on my noise cancelling headphones and read my book. This was an excellent test for them, as the noise from both the engines and the “ICE” (if you call it that) was a lot to overcome. A hot meal was offered (and didn’t appear too bad) but I was still glad I’d had my meal in the restaurant, and politely declined. The flight was again around 90 minutes, and my legs were thankful I wasn’t flying from somewhere further. Having taxied to our gate, some steps appeared at the very back door of the plane. Result! Disembarking from the back – we’d be first off! Alas, no – this was just for loading/unloading of meals etc.. Arse. We were literally the last passengers off the flight, and as we walked onto the jetty, I got an idea of just how far we had left to walk… miles! I could see the front of the North Terminal in the distance – and I realised we’d have to walk all the way around to the back of the building where arrivals entered…. Aaargh! 20 minutes later, we arrived at the immigration hall. Well, that’s a bit of a lie – we arrived at the queue that lead into the immigration hall. Luckily, UK immigration queuing just isn’t for me. Instead, I walked all the way around to the front of the queue (much to the disgust of the thousands of people in it) and up to the IRIS machine on the far left. I wandered in, dipped my glasses, stared into the machine, and seconds later the doors opened and I was through. All that remained to do was glance back with a cheeky grin, hold it for a few seconds, and then wander off down the escalators to baggage reclaim. Priceless. Sitting here now, it doesn’t seem like a week ago I was Skiing in St. Anton. It was a fantastic trip, and I really want to do it again soon. St. Anton definitely isn’t for the beginner – I would recommend that if you’re considering going, you be at a level where you’re confident on Red slopes in other resorts. Had the flight been longer (e.g. Athens) I’d have tried harder to get extra leg room seats… but for less than 90 minutes, I was happy to settle down and read my book. Oh, and for those that care, I’ve been reading Chickenhawk. And it’s ber-rilliant.